Above is my newest jewelry creation. 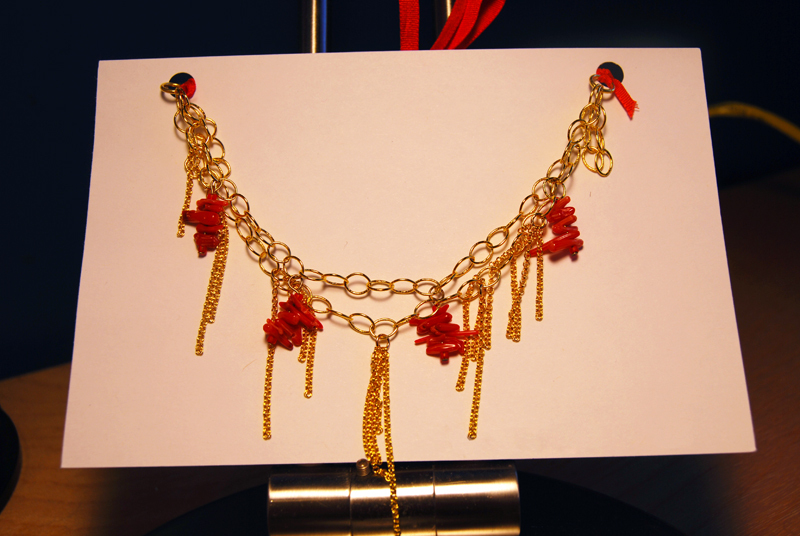 Although it may look like a necklace, it's actually a bracelet that ties with a red ribbon and is adorned with red coral. :) I hope that someone will be very happy this year, but you never know with your own designs and people's taste! Below is more of a personal part of the post, so if you don't fancy reading such stuff, this is the end of the post for you! Holidays are always a big deal at my house. It's probably because with 4 siblings on my mom's side and 5 on my dad's, I have an overwhelming amount of family. Out Thanksgiving usually consists of 30 people. However tempting turkey and pumpkin pie are, nothing really compares to our Christmas celebration. Christmas usually consists of a few days of family celebrations-- but this year, we decided to double the fun. Part of my dad's family came from the west coast and Virgina for 3 or 4 days, and left just this Monday. While they were here we did our own few days of Christmas celebrations. Last night I celebrated with friends, and tonight we all go over to my cousin's house to have a chili cook-off. (Complete with prizes). Then off we go to a friends party. Next on the menu are both Christmas Eve and Christmas day celebrations. Every year we do a secret santa on Christmas day-- I can't wait! On the 26th I fly to Czech Republic to see my boyfriend, his family, and friends. I'm VERY excited and have already started wrapping Christmas presents for them. Anyway, happy holidays to you all!